Have you always wanted to build a Windsor Chair? Well this is your year to do it. 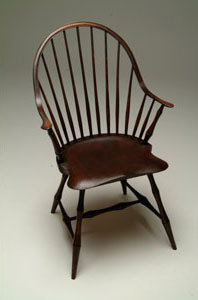 Peter Galbert is coming to Highland Woodworking in October to teach a class on building a stunning Continuous Arm Windsor Chair, and there are still slots open if you want to join him. The class will cover all the building action, from tree to completed chair. Students will split parts from a log, shave them, bend them and join them into their hand carved seat. Peter will cover topics including sharpening, wood technology and design, all which will enhance your ability to go forth and make chairs at home. And if you want to get a sense of Peter’s teaching style before signing up, take a look at the following videos, where Peter walks you through basic turning practice, as well as a two part video where he turns a windsor chair leg.